Around the 7,000 square mile parish he calls home, he is referred to as Father Leo. To the 185 families in Circle, Richey and Jordan, Montana, where he has served the past ten years he is a spiritual father and guide, celebrating with them weddings, baptisms and funerals. To the United States Air Force, he is Chaplain, Major, Leo McDowell, IMA (Individual Mobilization Augmentee) Chaplain. This summer, Chaplain McDowell will be serving as the Catholic chaplain at Manas Air Base in Kyrgyzstan. Chaplain McDowell, and an accompanying Protestant chaplain, will serve the needs of the 1,200 airmen assigned to the base as well as the many Marines and Soldiers who will transition through the base on their way to their deployments closer to the war zone. Asked what he is most excited about Father Leo responds, “I am looking forward to working with MABOS (Manas Air Base Outreach Society). Their mission to help the local community is truly an asset to the people of Kyrgyzstan.” MABOS recently passed a mile stone by helping fund their 100th and 101st heart surgeries at a local children’s hospital. In addition MABOS provides toys, clothing and sweets to children at many of the local orphanages. Father Leo has been serving in the Air Force Reserve since April, 1991 when he was commissioned as a Second Lieutenant, Chaplain Candidate, while completing his seminary studies. During this time he spent summers at Ellsworth AFB in South Dakota, and Sheppard AFB and Bergstrom AFB, both in Texas. He also helped out the Illinois Air National Guard based at O’Hare during the school year. After being ordained June 8th, 1994, Father Leo continued as a Chaplain Candidate for a year before starting the paperwork to be a chaplain. In December of 1995, Father Leo was re-commissioned as a First Lieutenant, Chaplain. 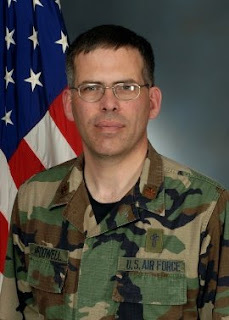 Father McDowell has been assigned to Malmstrom Air Force Base since 1995. After 9/11 he was mobilized, initially to provide backfill for deployed priests, and then deployed to Diego Garcia. He served at Grand Forks AFB, in North Dakota and Andersen AFB, in Guam in addition to his forward deployment to Diego Garcia. As Father Leo prepares for his next deployment, he asks for prayers for himself and all of those who are serving our in our military. Praying for a safe deployment. Praying for you and your Mission Father. You are in my prayers for a safe deployment. All of the PRA at PopularWireless has you in their prayers big guy! Check out the front page of PopularWireless! Contact us so we can send a care package! Thanks for all of the prayers.